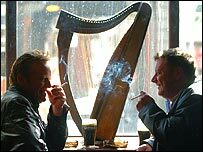 JD Wetherspoon is to ban smoking in all its 650 pubs by May 2006 amid fears smoky pubs are deterring customers. The firm, which has already pioneered non-smoking areas in its bars and lounges, said that 60 of its pubs will become smoke-free from this May. It said it wanted to ban smoking two years ahead of government laws. Chairman Tim Martin attacked the government's proposals, claiming that some pubs will still allow smoking if they do not sell food. JD Wetherspoon said it will ban smoking from this May at its pubs in London, Aberdeen, Newcastle, Glasgow, Bristol, Birmingham and Nottingham. The company's shares closed 3% lower at 252 pence apiece. Mr Martin said: "An increasing percentage of the population are giving up smoking and a significant number of people are staying away from pubs and restaurants because they are too smoky." He said the firm had pioneered non-smoking areas in its outlets, but felt "it is the right time to go one step further". He also criticised proposals which were unveiled by the government last November. The government announced plans to impose a sweeping ban on smoking in public places as it looks to encourage healthier living. What do drinkers at a west London Wetherspoons pub think of the ban? The White Paper on Public Health includes restrictions on smoking in licensed premises by the end of 2008. "The government's approach to the issue of a smoking ban does not make sense since pubs can get around it by giving up food sales," said Mr Martin. "We believe the Wetherspoon approach of a complete ban after a period of notice is the right one." Mr Martin told BBC Radio 4's Today programme he did have "some anxieties" about losing some trade to competitors as a result of the ban, but added the firm hoped "to strike the right balance". He added: "Half of smokers want to give up and 25% of people smoke and they'll still be able to smoke in our beer gardens, albeit not an enticing prospect in the middle of January and February". The move was welcomed by the Trades Union Congress (TUC) and health campaigners who all urged other companies to follow suit. TUC General Secretary Brendan Barber said it was right for firms to protect staff "from the dangers of second-hand smoke". "The bogus arguments that banning smoking is a threat to the pub, club and restaurant business must now fall flat on its face," he said. "But too many employers will continue to neglect their duty to keep their staff safe. It is the duty of the government to take the lead and make all workplaces smoke-free zones." Meanwhile, campaign group Ash (Action on Smoking and Health) called it a "significant development". 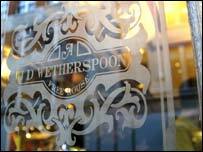 Spokesman Ian Willmore said: "This is great news for Wetherspoon staff as well as the general public. Wetherspoon are acting in advance of the rest of the industry." Dame Helena Shovelton, chief executive of the British Lung Foundation also urged other UK pubs to follow Wetherspoon's lead. She said: "There are 8m people in the UK living with a lung condition, and for many of them, going into a smoky pub environment runs a real risk of triggering a lung attack, which can result in hospitalisation."